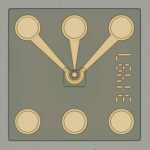 Ultra high speed InGaAs/InP photodiode chip with an integrated backside lens. The bottom illuminated p-i-n photodiode structure is optimized for 56 Gbd PAM-4 (400GBASE-DR4 and 400G-FR4) single-mode telecom, microwave photonic links, RF over fiber as well as test and measurement applications. It offers an excellent responsivity and high speed of response in the wavelength region from 1260 to 1620 nm. The integrated backside lens focuses the incoming light beam on the topside detecting area. 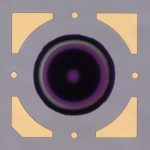 This increases the backside detecting diameter and allows easy and efficient optical coupling.